Set your stance in the WOO Sports App and the WOO knows if you did a trick in your normal stance (forward), or if you did it switch (SW). Switch tricks get a bonus score of +50 points. Rotations score flips and spins, with more rotation scoring higher. 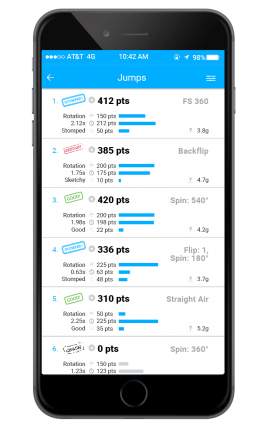 Tricks that include flips and rotations score both (e.g. Flips: 1, Spin: 180° for a Rodeo). Airtime scores are set based on your airtime. Bigger jumps up your trick score as your airtime increases! Landing Quality looks to see if you stomped the landing straight or skidded out as you landed. Finish your rotations in the air and ride away straight to maximize your Landing Quality.